It’s almost Mardi Gras, and we are in NYC, so we decided to indulge in a semla (plural: semlor) from the Swedish coffee shop Fika (41 W. 58th St.), which we had visited on a previous trip. So while many may think of king cake for Mardi Gras, we were in a Scandinavian mood. A semla is traditional Swedish brioche roll flavored with cardamom and filled with whipped cream, usually eaten before Lent. Understated, yet indulgent, this is definitely a Mardi Gras tradition we can get behind. Learn how to make your own semla at Saveur. Semla (or as it goes by many other names: fastlagsbulle, laskiaispulla, or fastelavnsbolle) is a Scandinavian pastry strongly associated with Lent in Finland, Denmark, Iceland and Sweden. Semlor (plural) used to be eaten on Shrove Tuesday/Mardi Gras, however, it is now eaten throughout Lent, especially on Tuesdays. Semla seems pretty easy to make – and consists of a cardamom flavored sweet roll filled with whipped cream and almond paste. During this time of year, all of the bakeries in Scandinavia stock semla, and it is the perfect snack to enjoy with your afternoon coffee break, or fika. 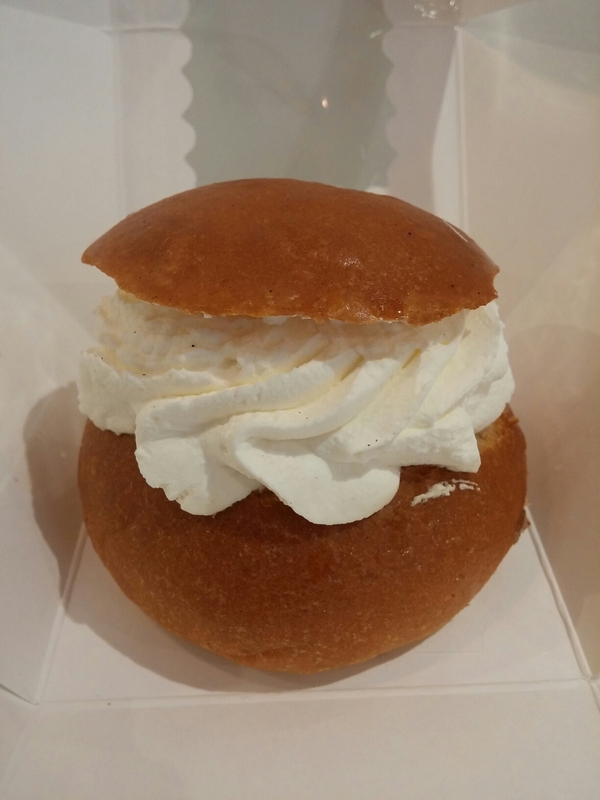 For those outside of Northern Europe, Camilla’s Cravings has a recipe for Semla. Fat Tuesday Around the World! It’s not called Fat Tuesday for no reason. Shrove Tuesday, the last day before Lent begins, is a traditional day of feasting. Naturally, in the US the focus is on Creole and Cajun Mardi Gras foods due to the big way that New Orleans celebrates the holiday. For an awesome intro, Epicurious has a new guide on Cajun and Creole food, because as we learned, there is a difference. If you’re feeling especially festive (or hungry) Chow has a recipe for King Cake (Galette des Rois – seen below) and Gumbo Pages has a history and recipe of the ubiquitous Muffaletta. However, in addition to the Nawlins Mardi Gras we know and love, there are some other pretty great food traditions, such as Paczki Day in Chicago. Paczkis (pronounced poonch-key) are filled doughnuts and are traditionally consumed in areas with high Polish populations. On the other side of the pond, the tradition in England is to have Shrove Tuesday Pancakes (is it a coincidence that IHOP has free pancakes today?). In Sweden, the day is called Fettisdagen, and a traditional pastry of semolina wheat called Semla is consumed. Basically every country or community that celebrates Easter has their own Mardi Gras food traditions, and they all sound pretty delicious to us!